In the late afternoon shadows, space shuttle Atlantis is still poised on the pad after its launch on mission STS-122 was postponed on Dec. 6, 2007. Thisstory was updated at 9:50 a.m. EST. CAPECANAVERAL, Fla. - NASA delayed the launch of the shuttle Atlantis to no earlierthan January early Sunday after faulty fuel tank sensors foiled the plannedspace shot for the second time in less than a week. The failureof one of four fuel gauge-like sensors at the bottom of Atlantis? 15-storyexternal tank during a preflight test prevented the shuttle from anafternoon launch here at NASA?s Kennedy Space Center spaceport. ?Confirmation,now, we have scrubbed for today,? said NASA commentator George Diller aftermission managers called off the launch attempt at 7:24 a.m. EST (1224 GMT). Afterscrubbing the launch, mission managers met to weigh options for Atlantis? spacestation construction flight and made an early decision to push the mission tono earlier than Jan. 2. ?That will be our nextopportunity,? NASA spokesperson Allard Beutel told reporters here at the Kennedy Space Center. ?We?re going to stand down for a couple of weeks and try to figureout this problem.? NASA wascounting down toward a 3:20 p.m. EST (2020 GMT) launch to begin its fourthconstruction flight to the International Space Station (ISS) this year. Themission had been delayedsince Thursday after two of the same four enginecut-off sensors failed a standard countdown test. A third sensoralso gave false readings once the tank was drained. The sensorsact as fuel gauges and are designed to shut down a shuttle?s three main enginesbefore its external tank runs dry. Intermittent malfunctions with the systemhave plagued NASA since 2005, when the agency resumed shuttle flights followingthe Columbia tragedy. Whileprevious NASA flight rules required three of the four sensors to work properlyfor launch, mission managers imposed a stricter rule calling for all four toperform nominally for today?s attempted liftoff. They also curtailed Atlantis?five-minute launch window to just one minute in order to conserve fuel andensure the shuttle?s fuel tank has enough propellant to reach orbit should thesensors fail during liftoff. In theearly stages of fueling Atlantis? external tank with the more than 500,000gallons (1.9 million liters) of super-chilled liquid hydrogen and liquid oxygenpropellant required for launch, all four sensors performed as designed. Aninitial check found them to be working properly and prompted a ?brief burst ofelation? that soon evaporated when a sensor failed a subsequent test. ?Of course,in the firing room, we were very excited and felt like we had a good system andwere getting ready to go fly today,? Doug Lyons, NASA?s STS-122 launchdirector, after the scrub. Thatexcitement, he added, faded minutes later when one of the sensors failed thesame test. NASAshuttle program manager Wayne Hale said Saturday that if a fuel sensor glitchprevented a launch attempt today, any troubleshooting efforts could potentiallyhinder Atlantis from launching before year?s end. ?Probably,it would reduce our chances of launching in the December window substantially,?Hale said. Lyons said shuttle engineers have aseries of options in order to respond to Atlantis? fuel sensor woes. 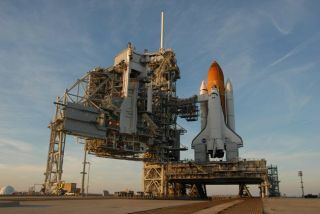 They wouldperform troubleshooting efforts at the shuttle?s launch pad, and may even beable to replace the sensors there, before resorting to rolling the orbiter backinto its protective Vehicle Assembly Building (VAB), he said. ?There?s agreat deal of troubleshooting we could do at the pad, and that?would be ourfirst course of action,? Lyons said Saturday. ?We?d exhaust all those efforts,I think, before we?d even entertain going back to the VAB.? Commandedby veteran shuttle flyer Stephen Frick, Atlantis's planned 11-day mission willdeliver the European Space Agency's Columbuslaboratory to the ISS and swap out one member of the outpost'sthree-astronaut crew. At least three spacewalks are planned during the missionto install Columbus and upgrade the ISS. Slated tolaunch spaceward aboard Atlantis with Frick are STS-122 pilot Alan Poindexter, missionspecialists Rex Walheim, Leland Melvin, Stanley Love and European Space Agencyastronauts Hans Schlegel and Leopold Eyharts. NASA had aslim window that closes on Thursday, with a possible one-day extension, inwhich to launch Atlantis before sun angles become unfavorable. With dwindlinglaunch opportunities and a sensor glitch that remains unexplained, missionmanagers decided to delay the flight until early 2008 and hunt down the glitch. ?Our goalis to fly in space and do it safely and successfully,? Hale said Saturday.